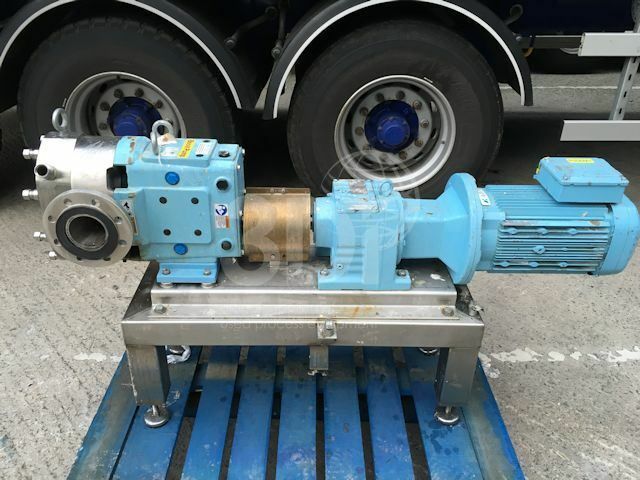 Used 34.1m3/hr Rotary Lobe Pump, manufactured by Waukesha Cherry-Burrell, 2011. Model 130 U2. Material of construction: stainless steel. Connections: 3″ inlet/outlet. Max pressure: 13.8bar. Complete with SEW Eurodrive and 5.5kw SEW electric motor (ATEX Rated, 3ph, 50hz, 400/680v, 1455rpm). Supported on a base plate with adjustable legs. Previously used on cosmetics.